Aesthetic nose surgery (rhinoplasty) is perhaps the most difficult of all facial surgery operations. Rhinoplasty requires an understanding of art and science. 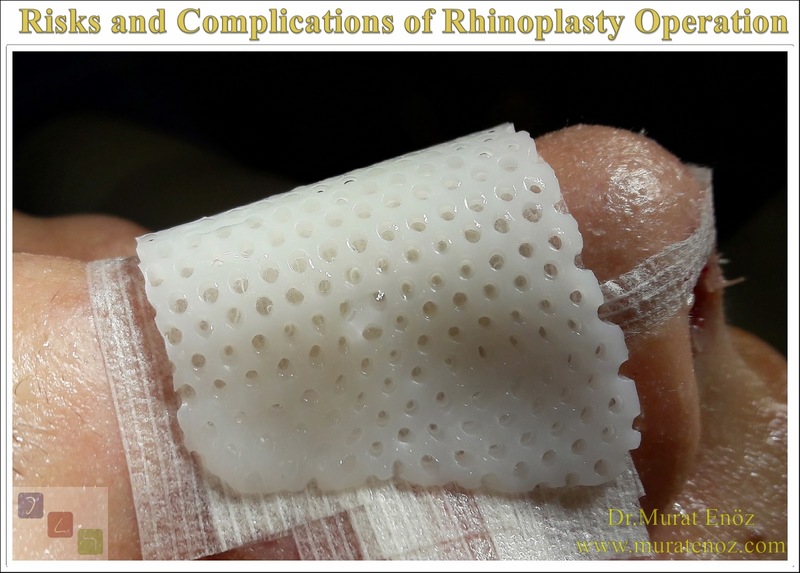 Determining the specific shape of the individual and attempting to shape it has made it a rather variable, difficult and detailed surgical procedure than a standard procedure. Complication can be defined as unexpected medical or surgical adverse event. According to the current literature, the complication rate for nasal surgery ranges from 4 to 19%. As surgical experience increases, this rate generally decreases. Skin and related soft tissue complications occur in 10% of cases. According to estimates, serious systemic or life-threatening complications occur in 1.7-5% of rhinoplasty cases. Intracranial complications are rare. As minimally invasive techniques arise and the materials with increasing tissue compliance are produced, the risk of complications can be reduced. People, in addition to being aesthetic surgery in order to look better, often get rid of other problems created by the related organ. For example, a person with nose surgery may have a more beautiful nose, with nasal obstruction, sinusitis, etc. as well as diseases and problems. There is a separate challenge for the operation, which varies according to each person to whom nose correction surgery is applied. Before surgery, all the problems that need to be corrected from aesthetic and functional point of view must be identified one by one. Then various methods need to be evaluated and planned to correct these disorders. Planned techniques should be applied patiently and meticulously in nasal surgery. Obtaining good results is a difficult operation. When nose surgeries are performed by an experienced and skilled surgeon, the results may be good, with few complications and undesirable consequences. Complications and adverse outcomes may develop during nasal aortic surgery, as in all surgeries, but there is no complication for those who do not have surgery at all. If you have a nose operation, you should ask your doctor about any problems and complications that you may have. Before surgery, you should ask your doctor about all the questions about negative and unwanted developments, especially those that you may have during surgery. It is important for your confidence with your doctor. Throughout our lives we face various risks every day and even every minute. We face risks of various accidents in traffic, at home, in sports, swimming and on holiday. Even if it is very low even when eating, there are risks. When you have surgery, you are also taking some risks. There is a risk of complications even at very low levels even in the best conditions. The risk is much lower during surgery performed by experienced physicians. Complications during nasal surgery may occur during surgery, early and late post-operatively. In general, various aesthetic - functional problems such as nose bleeding, prolonged bruise and edema, perforation in nose septum, infection, adhesion in the nose and various aesthetic deformities, nasal sagging, deformities due to supportive tissue loss in the nose etc. Rarely, there are eye-related complications and tear ducts injuries. The rhinoplasty operation is a specially planned operation. Patient-specific techniques include various procedures for cartilage, subcutaneous tissue and bone. For this reason, after rhinoplasty, various problems can occur with skin, subcutaneous, cartilage and bone. 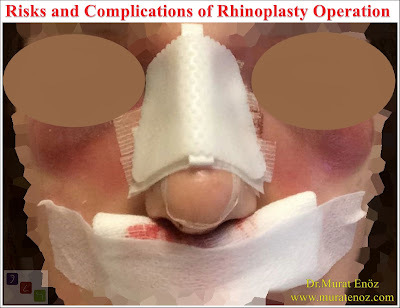 Postoperative deformities are considered as main risks of rhinoplasty, causing revision surgery in 5% to 15% of the cases. After rhinoplasty, not only depends on the surgical technique; At the same time, the patient's care and healing properties also affect the amount of aesthetic rationales present in the operation. It is not easy to obtain full millimetric symmetry after aesthetic nose surgery in a somewhat asymmetrical body of the anatomy. Asymmetries that can occur in this situation and are less than before can also be seen due to the natural recovery process. In the nasal aesthetic operation, nose shaping is performed on living tissue. The shape and structure of these tissues can change when the side is healed.